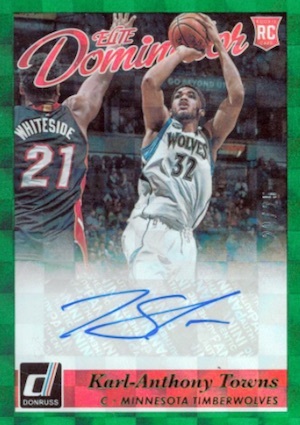 Although big men struggle to get their due respect in the hobby, Karl-Anthony Towns is continuing to boost his profile with collectors. 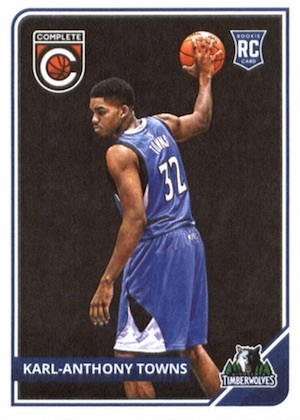 One of the standouts from the 2015-16 NBA Draft class, Karl-Anthony Towns rookie cards have been gaining traction since he was the named the unanimous Rookie of the Year in his first season. 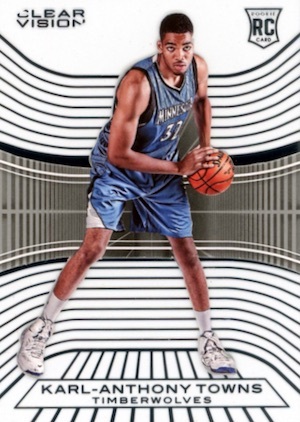 Collectors can find official Karl-Anthony Towns rookie cards in 2015-16 basketball products. 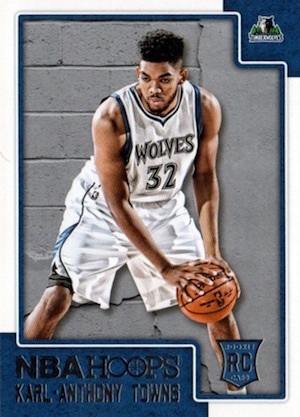 It is important to note that Towns is one of several Panini exclusives from the 2015 class. He also had some early Panini promo cards from the 2015 NSCC and Black Friday packs. 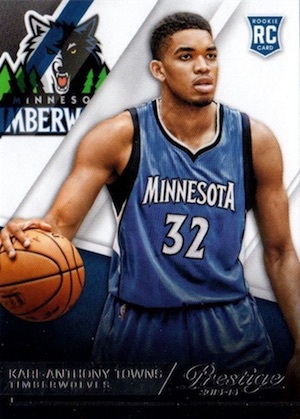 Shop for Karl-Anthony Towns rookie cards on eBay. 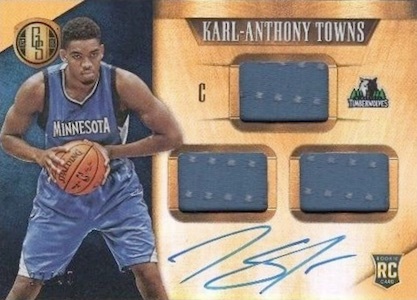 The following guide compiles all the Karl-Anthony Towns rookie cards in one place. 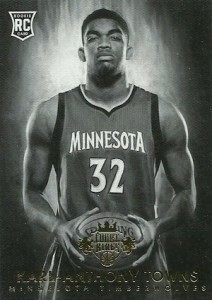 In addition to the main rookies from each set, several key inserts and autographs are also covered. Click on the listings to shop for cards on eBay. Linked sets in the descriptions go directly to product profiles. 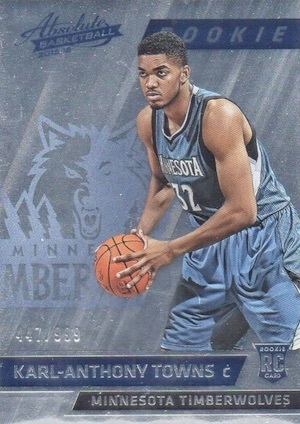 Inexpensive and part of an established line, the Rated Rookie card for Towns in 2015-16 Donruss is a great choice for those with limited funds. If you have more to spend, check out the signed Elite Dominator insert. 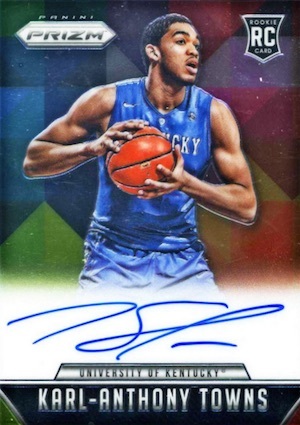 Another basic rookie option, 2015-16 Hoops has a more quality look with the foil and glossy finish that is better than the budget pricing indicates. 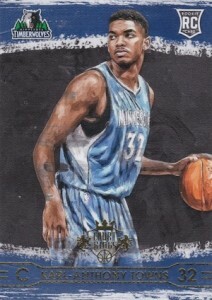 Hoops remains the favorite for low-end collectors and offers a low-cost rookie for Towns. The relic-heavy 2015-16 Absolute Memorabilia sticks with a basic rookie for Towns that is mostly foil. Limited to 999 copies, there are also Spectrum Gold (#/10) and Black (1/1) parallels. 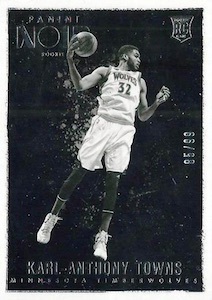 The popular Tools of the Trade insert gives collectors signed KAT cards to chase. 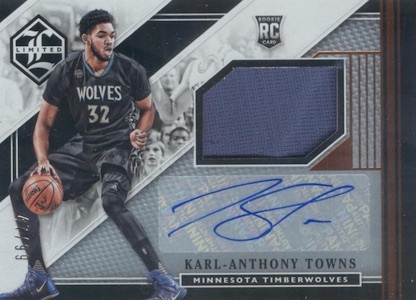 Although not in the base selection, '15-16 Black Gold has a Karl-Anthony Towns signed relic in the Rookie Jersey Autographs set. 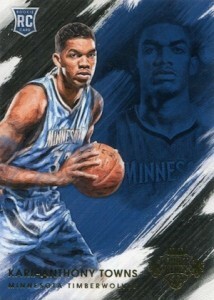 Towns is also part of Sizeable Signatures. 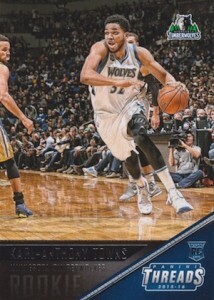 Using the magic of acetate, 2015-16 Clear Vision brings KAT collectors a base card with a blue uniform and a more limited variation with a white uniform. Meanwhile, the Clear Vision Signatures insert goes with a trapped acetate autograph. They don't get more simple than this. 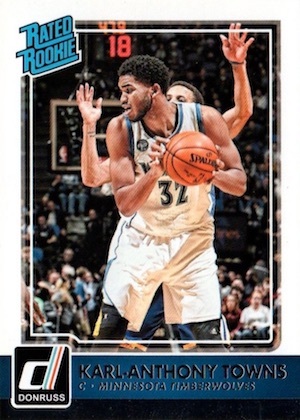 2015-16 Complete is a low-end product with no frills and that is what this rookie card for Towns delivers. 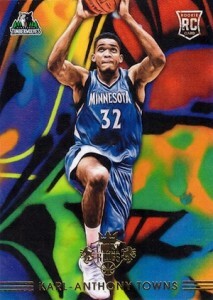 Vivid colors and artistic designs treat collectors to a whimsical take on Karl-Anthony Towns rookie cards. 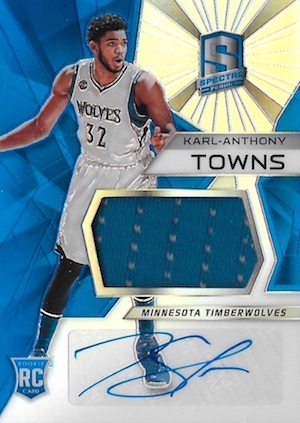 There are actually six different cards for Towns in 2015-16 Court Kings and each features a different look and rarity. While most present large or moderate print runs, completists may have trouble with the final card (#266), which is limited to just ten copies. 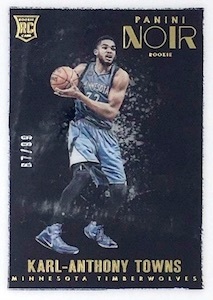 The rarest rookie for Towns, most collectors are unlikely to ever come across this 2015-16 Gala card limited to just eight copies. However, he does have several on-card autographs in the product that are much more plentiful. 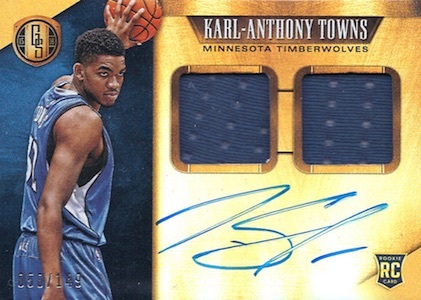 2015-16 Gold Standard offers a trio of Karl-Anthony Towns rookie autographs that are, understandably, shimmering with a gold design. On-card autographs give it even more appeal. Collectors can find increasing relic pieces along with a decreasing print run among the three choices that all feature a horizontal layout and different image of Towns. 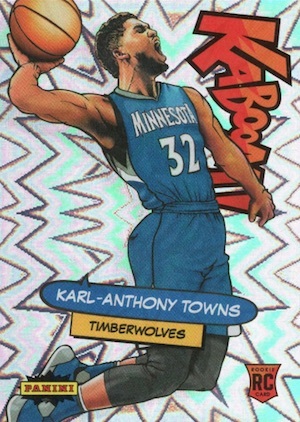 In 2015-16 Excalibur, the base Karl-Anthony Towns rookie card is just the appetizer. Collectors are much more excited about the Crusade and Kaboom inserts. 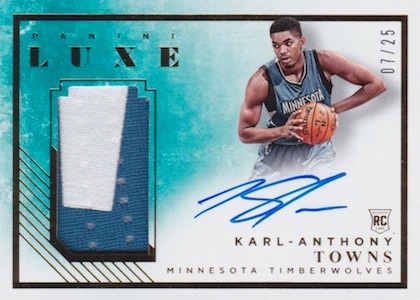 With a diamond and print run of 20, '15-16 Flawless is a key part of Towns' most premium rookie choices. 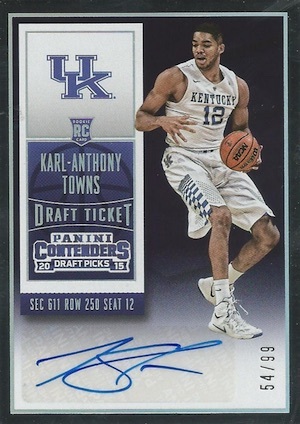 Collectors also like the on-card KAT autograph cards in Flawless. 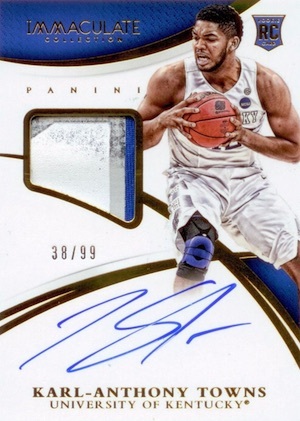 Another high-end option, not many sets can match this RPA card for Towns from 2015-16 Immaculate Collection. The Red parallel shown below is even more elusive with just 25 copies. 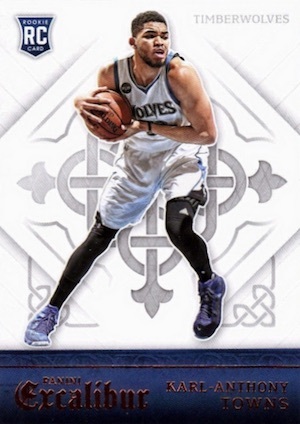 While the rookie card itself is fairly simple, Panini delivers on the 2015-16 Limited tagline thanks to a base print run of just 80 copies that is joined by Silver (#/49), Gold (#/25) and Platinum (1/1) parallels. 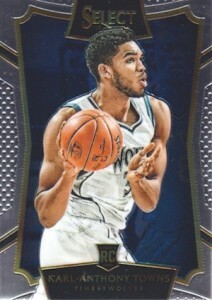 Towns is also included in the Rookie Jersey Autographs insert that is numbered to 99. 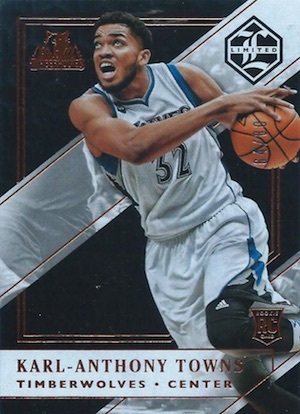 Without a traditional base set, 2015-16 Luxe has several KAT cards that could lay claim to the rookie title. 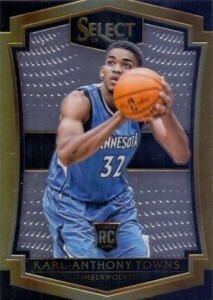 The Rookie Memorabilia Autograph is the most likely option with an on-card card autograph and jersey swatch. There are also a few others that are popular with collectors, including the framed cards. 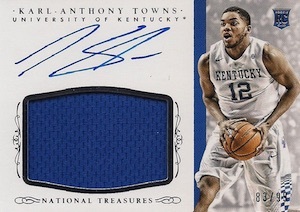 Arguably the ultimate rookie card for Karl-Anthony Towns, 2015-16 National Treasures is high-end all the way with a print run of just 99 and a premium design. 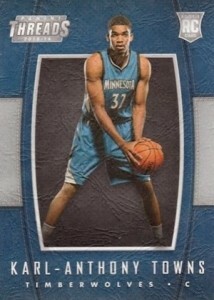 The on-card autograph and large patch further set it apart from most of his other first-year cards. 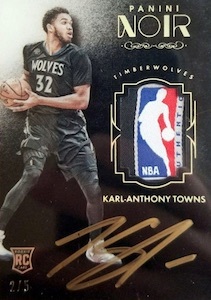 With a pair of base cards and a pair of autograph patch cards, there are actually four different rookie cards for Towns in 2015-16 Noir. The problem is that they are each numbered to 99, so the overall supply can make things tough if you are trying to track them all down. 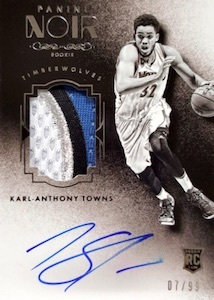 A larger image of Towns coupled with the diagonal striping and oversized T-Wolves logo gives the Prestige rookie a distinct look. 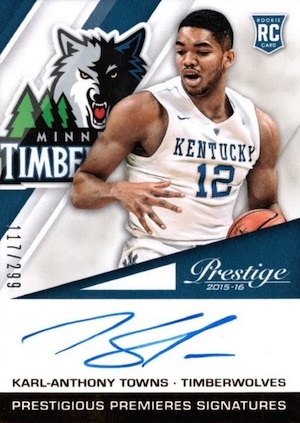 Collectors should be aware that 2015-16 Prestige is exclusive to Target. 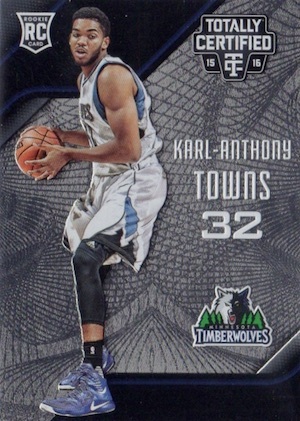 There is also a popular on-card autograph for Towns in the release with a print run of 299. 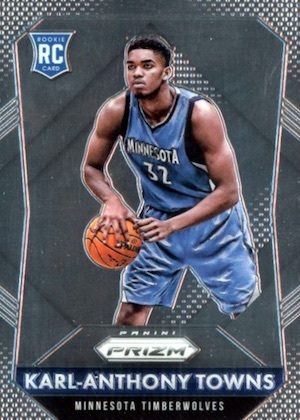 While the Prizm-ization has chopped Towns off at the knees, it is a little odd that one leg has been trimmed to his shorts while the other has not. 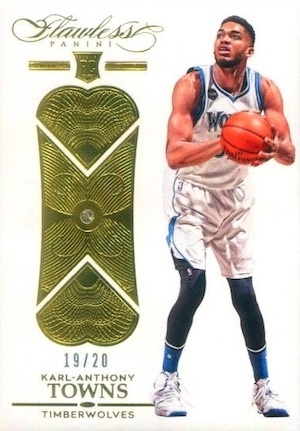 Despite this floating illusion, and as long as legs are not a requirement, 2015-16 Prizm is a popular selection with plenty of colorful parallels. 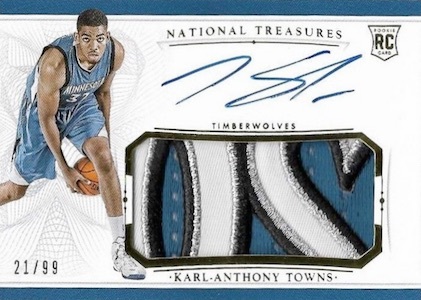 While it does feature college gear, Prizm also offers a pretty impressive autograph for Towns. 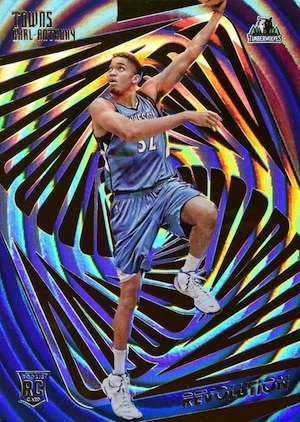 Easily the wildest rookie design for Karl-Anthony Towns, 2015-16 Revolution taps into the 1990s nostalgia with a swirled background and several tiers of parallels. 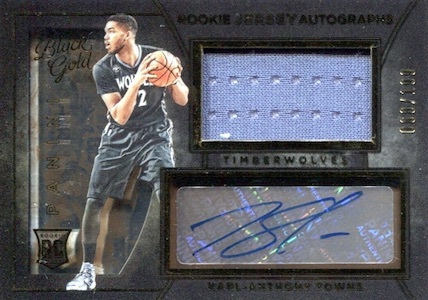 There is also an on-card rookie autograph for Towns in the product. 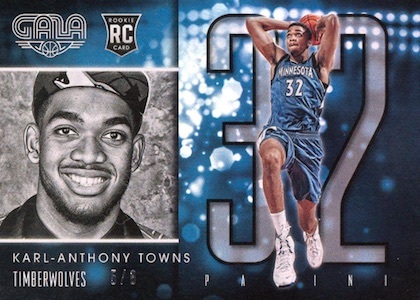 2015-16 Select has three separate designs in the main base set which ultimately means three different Karl-Anthony Towns rookie cards. While they do feature a different look, all three incorporate gold, black and foil into one ornate design. The rarest of the bunch is Courtside, which is shown last with the Silver parallel version that resembles a Superfractor. 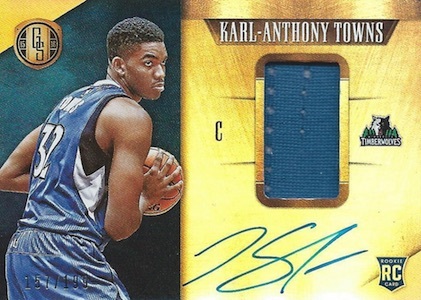 If you need considerable shine and a rookie signature for Towns, check out 2015-16 Spectra. The colorful set packs Prizm technology and few low-numbered parallels to go with the main version that is not numbered. 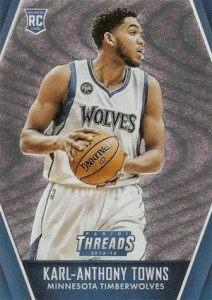 Another release with multiple rookies in the main set, 2015-16 Threads is only found at Target locations. Issued in specific formats, collectors can find base rookies and Leather rookies in Premium boxes, Wood rookies in blaster boxes, and Micro-Etch rookies in Gravity packs. Somewhat similar to Prizm and Select, 2015-16 Totally Certified also relies on the silver foil but incorporates a little more detail into the design. While the large name headline is expected, the prominent placement for the jersey number is not. Again like Prizm, colored parallels offer more rarity. A plus, however, is that his legs were left intact. 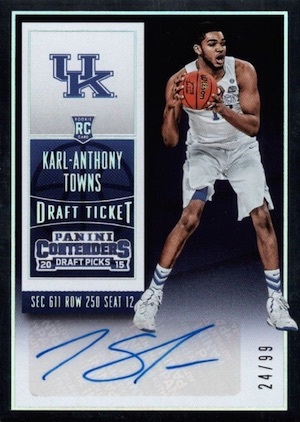 As the college version of the popular brand, Kentucky Wildcats supporters will be extra interested in 2015-16 Contenders Draft Picks. 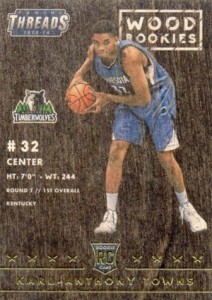 Towns has two versions but Panini never revealed which was the short print so collectors are left to guess. It does appear that the version on the left (both hands on ball) is the more common of the two. 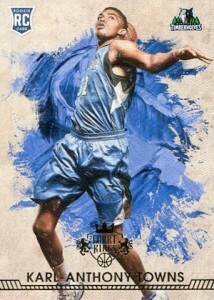 Another college card for Karl-Anthony Towns, this is part of the high-end multi-sport Immaculate Collection release. There are several different versions but his RPA is the top option for most. Each of the cards is very limited, so these might a bit tougher to locate as time passes. Similarly, the National Treasures brand is also extended to college and Towns is included with a horizontal design. 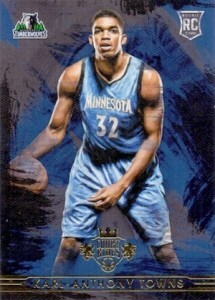 Limited to 99, the premium multi-sport card features an on-card signature and large jersey patch. 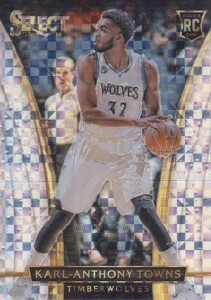 2015-16 Panini Prizm Light Blue Karl Anthony Towns RC 199 !!! KAT has a Spectra AU RC as well ! Karl-Anthony Towns Kristaps Porzingis 2015-16 Immaculate RC Acetate Auto 21 49! 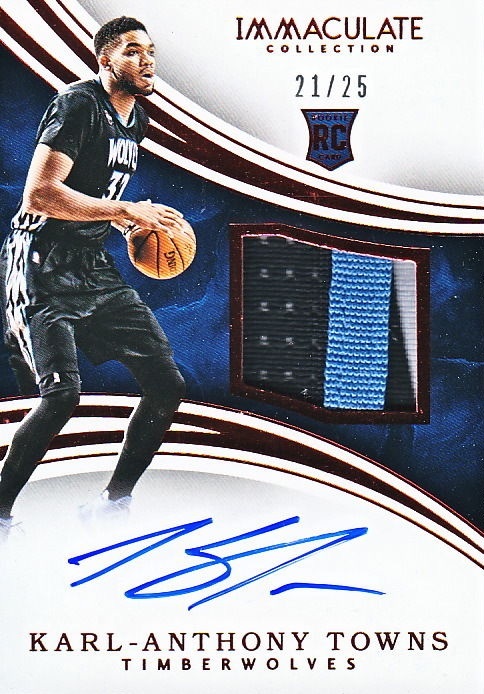 Karl-Anthony Towns 2015-16 National Treasures Rookie Patch Auto RPA 56 99 BGS 9!